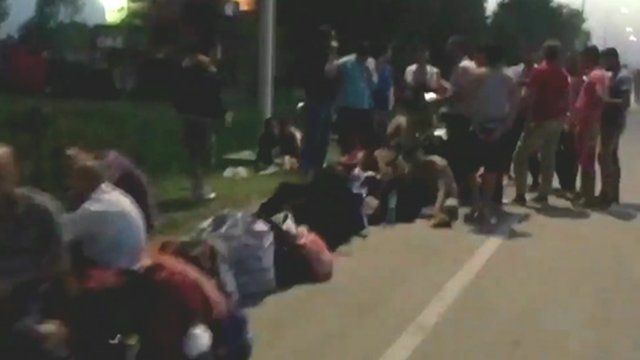 Timelapse shows border migrant queue Jump to media player Timelapse footage shows queues of migrants in Tovarnik at the Croatian border with Serbia on Friday as thousands wait for buses. Huge crowds wait at Croatian border Jump to media player The BBC's Lyse Doucet reports from the Croatian border town of Tovarnik, where large crowds are waiting for transport and help. Chaos at the Croatian border Jump to media player The Croatian government says it can not cope with the sheer numbers of people arriving, just a day after welcoming refugees and migrants following violence at the Hungary border. Migrants and police clash at Croatian border Jump to media player Migrants travelling from Serbia have pushed through riot police lines after waiting for hours in the heat at the Croatian border. Migrants stranded in Croatia have been making renewed efforts to head north despite moves by Slovenia and Hungary to hold them back. The BBC's Gavin Lee filmed queues of migrants in Tovarnik at the Croatian border with Serbia on Friday as thousands waited for buses.